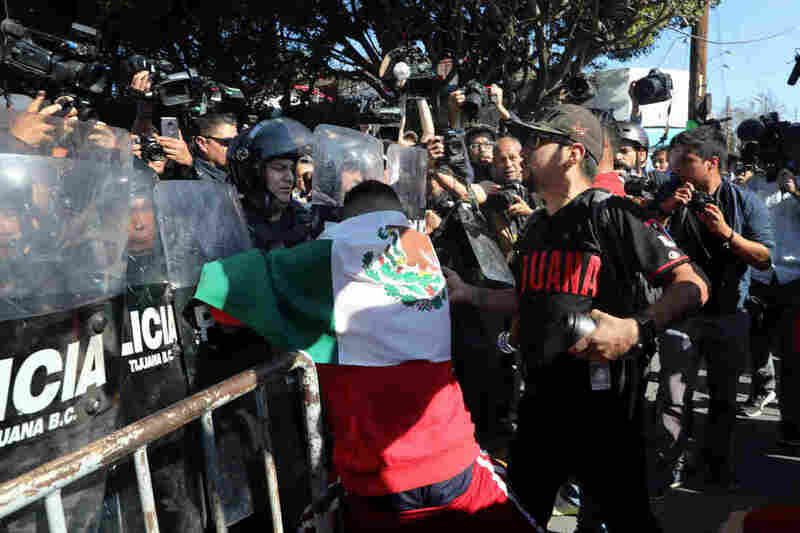 Shouting 'Mexico First,' Hundreds In Tijuana March Against Migrant Caravan While some residents of the northern Mexican city have said "all migrants are welcome," a group of protesters this weekend demanded they be kicked out. 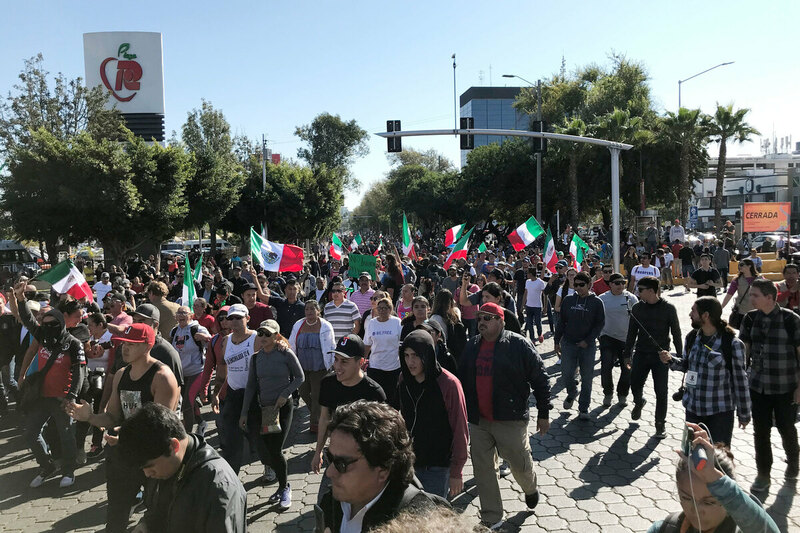 A few hundred people gathered in Tijuana's high-end Rio area on Sunday to protest against groups migrating from Central American countries. The march is a foreboding sign for the migrants who have formed caravans to cross Mexico in hopes of reaching the United States. Many, but not all, of the migrants have come to Tijuana, which borders San Diego, to request asylum in the U.S. They come primarily from Honduras, though some are from other Central American countries. A number of the asylum-seekers say they can't return home after receiving threats from street gangs such as MS-13 and the 18th Street gang, as well as threats from government figures in their countries. "They should create concentration and deportation camps with federal funds," wrote one commenter on the Facebook page organizing the march. "Tijuana is a place that welcomes anyone, but you must have papers, you must identify yourself," demonstrator Magdalena Baltazar said on Sunday, as she waved a Mexican flag and marched through the city. "We work hard here. We don't get handouts. The government shouldn't be giving things to migrants when plenty of Mexicans are in a difficult position." The marchers had intended to head to the mayor's office to demand action but, as police cars raced ahead to block intersections, many protesters veered off, heading toward a shelter where more than 2,500 migrants are staying, according to Tijuana city officials. Many in Tijuana, however, are angered by the demonstrators' anti-immigrant sentiment. "F****** racists!" shouted a man from a street corner. "Say that to my face," a protester yelled back. "This is not what Tijuana is like!" cried an elderly woman. "All migrants are welcome here!" Police stand guard to protect a migrant shelter as demonstrators protest the presence of thousands of Central American migrants in Tijuana, Mexico, on Sunday. Police kept the migrants inside the shelter to avoid conflict. The only sign of the march from inside was distant shouting and horns. Carlos González, a migrant from Honduras, angled a little mirror to get a view of the protest down the block. "What do they intend to do?" he asked. "There are women and children in here." The demonstration thinned out over the next few hours. But it left some migrants startled. "We don't know why they came here. I don't know what we did to offend them, so what are we supposed to do?" said Jesús Uribe, from Nicaragua. "This is the first time I've felt this in Mexico. Mexicans have been very welcoming to us." Tijuana's mayor hasn't helped ease tensions over the migrants. "I would dare say that not all of them are migrants," Mayor Juan Manuel Gastélum said last week in an interview with Milenio television, suggesting some members of the caravan were criminal infiltrators. "Sure, there are some good people in the caravan, but many are very bad for the city." Gastélum said four alleged members of the caravan had been arrested for unspecified crimes. "Human rights are for only upstanding humans," he said, creating a perverse turn of phrase in Spanish. The Tijuana mayor has been seen sporting a Trump-style "Make Tijuana Great Again" hat. But Gastélum is not a popular leader: A poll in March gave him just 4 percent approval from residents. The murder rate in the city has spiked during his tenure. The Tijuana city government is providing a stadium for the migrant shelter, as well as blankets, sleeping pads, food and some basic medical care. Nonprofit humanitarian groups are adding to that support. But Gastélum says Tijuana lacks the funds to continue supporting the migrants, who he thinks will be in the city for more than six months to be processed through the U.S. asylum system, and has requested support from Mexico's federal authorities. Even before the caravan reached the city earlier this month, migrants in Tijuana created an informal list of names to keep track of those hoping to seek asylum in the U.S. As caravan members have added their names, the list recently surpassed 3,000. "I'm not sure what we're going to do," said Cristian Menéndez, a 32-year-old Honduran, traveling with his girlfriend and her two children. "We all know we want to request asylum but I haven't heard about the list. We don't know how long this will take. We don't know how long there will be food for us to eat."